The performance of Usmanov Classical Russian Ballet, 'Pinocchio, the musical' and a gospel concert complete the offer of the new season. The programme will begin on 20 September with the musical 'Les Misérables', to reach Logroño at the hands of the production company Stage Entertainment, backed by hits like 'The Lion King' or ' Mamma Mia!'. 'Les Miserables', one of the musicals that aroused greatest interest and recognition among fans of the genre, has had more than 65 million viewers worldwide. There will be eight shows between 20 and 25 September, coinciding with the feast of San Mateo in Logroño. Luz Casal will rise to the stage of the La Rioja Conference Centre and Auditorium on 8 November to perform the themes of her latest album, 'Twin souls', where the singer is able to assimilate new and intimate sounds without relegating her most essential rock to the background. The unmistakable voice of Luz, full of nuances, offers one of the most deep and complex of her prolific career. On Saturday, 22 November, children have an appointment with music thanks to the Circo en Familia, which is coming to the Riojaforum with their show 'Pinocchio, the musical'. There will be two performances, at 5 pm and at 7.30 pm. Attendees can enjoy the adventures of this endearing puppet performed by acrobats, dancers, musicians, actors and singers involved in this spectacular staging that recovers the best of circus, with a surprising set-up. The next event will take place on 13 December, when the Usmanov Classical Russian Ballet performs The Nutcracker Suite at Riojaforum. The staging is based on the lyrical and artistic delicacy of classical dance at the highest international level, without losing the design and aesthetics of pure Russian ballet, introduces elements that enrich the work of Tchaikovsky in a surprising way. With a cast of the most renowned Russian artistic skaters and tightrope walkers, the show is certain to surprise the viewer with tricks and unimaginable effects on a theatrical stage. On 20 December, the show Whitney's Happy Days will pay a tribute to Whitney Houston. The show is at the Riojaforum and it will be performed by the Georgia Mass Choir, a Georgia-based ensemble performing since 1983 and that has been reaping success in the gospel genre for several decades.. The programme will end on 24 January with a performance by the Prague Symphony Orchestra which will play Brahms' Violin Concerto in D major and Sibelius' Symphony No. 2 in D major. The Orchestra has been enriching the cultural life of the Czech capital since 1934. Its conductor, Heiko Mathias Förster, is one of the most admired young directors of his generation, while his first violin, Ivan Zenat, is one of the most prominent at the European level, a frequent guest of international orchestras such as the BBC Symphony Orchestra in London, Symphonieorchester des Bayerischen Rundfunks, Orchestra of Berlin, or the National Orchestra of Madrid as well as all the orchestras of his country. He is highly appreciated for his technical perfection, taste, style, and his captivating tone. ‘Les Misérables’; more than a musical, a legend. From 20 to 25 September, several shows at different times. Tickets from 45 euros to 75 euros. In addition, parallel to the programming of Riojaforum, La Rioja Conference Centre and Auditorium will host the children's show Cantajuegos, coming to Logroño with their performance 'Ten', commemorating the tenth anniversary of this company, the children's favourite. The famous clowns Coco, Pepe, Buby and Tallarín, as well as his new friends Pato Contreras, Khon Gorila and many more characters, will perform next to the Cantajuegos their best-known songs, including all-time hits and also many new songs from their star 2014 DVD. It will be on 18 October with two shows: at 4.30 pm and 7.00 pm. 22 euros for gallery seats and 26 euros for stalls. This season, there will be three season tickets that do not include Pinocchio, the musical and Les Miserables. The full season ticket includes 4 shows at the Auditorium and has a 20% discount on the total price. In addition, there are two partial season tickets, one classical and another popular, with 2 shows each, featuring a 15% discount off the normal price. Also the previous season subscribers can keep their seats. from 19-23 June, at the Riojaforum box office from 11.00 am to 2.00 pm and 5.00 pm to 8.00 pm. New season tickets will be on sale from 24 to 27 June, both inclusive, at the same times. Tickets can be purchased any time for individual shows from 28 June at www.riojaforum.com and www.entradas.com. 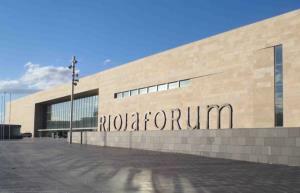 Single tickets can be purchased at the Riojaforum box office two days before each show at regular opening hours. Tickets for 'Les Misérables' are already on sale. Riojaforum makes a special effort to bring young people closer to music and culture and continues to offer a 50% discount on tickets for youth card holders and students of music of La Rioja in all shows except 'Pinocchio, the musical' and 'Les Misérables'.